Getting around: A vehicle- be it a car, camper, etc. The best first day is one that is most flexible. Once you get to Banff, drive straight to the Sunshine Village Ski Resort and take the gondola to Sunshine Meadows. How much you do at the top depends on the time you have and your energy level. Arrive in Calgary and drive 2 hours to Banff National Park. From Banff, drive to the Sunshine Village Ski Resort (about 20 minutes). Take the gondola up to Sunshine Meadows. Walk to the Rock Isle Lake view point and then down to Rock Isle Lake for photos and a good lunch spot. Option 1: Hike Healy Pass (18.2km, 5-6.5 hours). Option 2: Hike the Grizzly/Laryx Lake Loop (8km, 3.5 hours) (the less strenuous and most popular option). Enjoy the rest of the day walking the streets of Banff to find your dinner spot, buy souvenirs, etc. Sunshine Meadows should definitely be enjoyed in good weather. I arrived to the viewpoint to serious cloud cover and decided to wait till it cleared and it made a huge difference! 1. Marble Canyon, which I think is the prettiest canyon in all of the Rockies. 2. Lake Minnewanka where you can take a boat cruise or just explore around the lake. 3. Banff Upper Hot Springs, a warm way to enjoy unpleasant weather; although I do prefer natural hot springs more. 4. Johnston Canyon, as one of the most popular trails in the Rockies, I have put it as a rainy day activity because it is BUSY. The only time you can enjoy it is early mornings, at night, or when it looks like it won't be a clear, nice day. So definitely see it, but it doesn't need to be in high season or during nice weather! 1. Nourish Bistro Banff- Vegan restaurant in Banff. It was very challenging to find any vegan options so we ate here ALOT even with how pricy it is. 1. (Moderate) BnB's in Banff- A very popular way to stay in Banff. It can sometimes feel like every other house is a BnB! 2. (Budget) HI Banff (Hostel)- I highly recommend this hostel, although it is a little outside of the central Banff area. Extend your time to take in sunshine meadows' splendour over 2 nights/3 days in the BC Backcountry with an out and back trip to see the "Canadian Matterhorn". This backpacking trip includes everything in Day 1 of the 5-Day Itinerary (the Sunshine Village gondola and seeing Sunshine Meadows) due to Sunshine Meadows being the starting point of the backpacking trip, so I recommend your actual Day 1 be the drive in from Calgary and any one of the 'rainy day alternatives' listed for Day 1 so you can enjoy the town of Banff and the surrounding areas. Drive to the Sunshine Village Ski Resort (about 20 minutes). Take the gondola up to Sunshine Meadows, making sure to know the time of the last gondola down for when you return in a few days time. Hike to Og Lake (22.2km, 6-8 hours) to camp. Continue from Og Lake another 6km to your final destination, Lake Magog to camp. Although I found Og Lake campsite much better (Lake Magog campsite is crowded and has lots of mosquitos in the summer), it is the best access point for the main event- Nub Peak, the quintessential view of Mt Assiniboine! Once at Lake Magog, continue up to Nub Peak (additional 10.6km roundtrip, 3-3.5 hours) where you will also pass the beautiful Sunburst and Cerulean lakes. (Nub Peak is the place to watch both sunset and sunrise). Start early as you head back to Sunshine Village the way you came (28.2km total) and make the last gondola. If this is too much distance to cover, you can spend an additional night at the Porcupine campsite between Og Lake and Sunshine Village. Note: If this is your first hike in the Rockies, recognize that this covers a lot of mileage in 3 days and there is some altitude. Add an extra day if you are concerned of your level of fitness or if you just want to make sure you get great weather for Nub Peak! Or, if you have the budget for it, take advantage of the lodge providing helicopter transport! ANOTHER note: this hike can be done one way (rather than out and back), if you exit via the Mt Shark Trailhead, which is in the Canmore area. From Lake Magog to Mt. Shark Trailhead is still about 27km, so you don't cut down a noticeable amount of mileage on your last day out. Also, the trail is not comparable scenery-wise, especially the last 10k being on a gravel road, and you will have to arrange shuttle back to your car or hitchhike to Banff and then take Sunshine Village's shuttle back to your car. (I actually did it this way and would recommend out and back for better views and the benefit of arriving to your car). Sunset on day 2 and sunrise on day 3 at the Niblet/Nub Peak. Although this itinerary assumes camping, two cabin-style accommodations are available. Adjustments to the itinerary would be to hike the full 28.2km to Lake Magog on the first day to reach them. The bonus is how little you would need to carry. Two nights are still preferred. Get to know the lifestyle of people living in the Rockies by visiting Canmore (where most locals in the Canadian Rockies live). The famous 22km Banff Legacy Trail is scenic and a safe, easy cycling experience. If biking, rent a bike for the day and head out on your 2-3 hour bike ride (one way). I recommend leaving as early as possible to beat the heat (less bike traffic and car noise is also preferable). The Valley View Day Use area is the half-way point and an excellent snack stop. Once in Canmore, have lunch at Communitea Cafe. Visit the Tourism Canmore Office to get additional suggestions for activities (routes for biking and/or hiking) nearby if you would like to explore further. Some of the notable hikes are East End of Rundle, Ha Ling Peak, Rawson Lake and Sarrail Ridge, and Mount Engadine. These require a car to get to the trailhead, so if you biked, taking a cab (15 min drive) would save a challenging 1+ hour bike ride. Opt to either bike back or take public transportation (with your bike) back to Banff (about 30 minutes by bus). Drive approximately 40 minutes from Banff town centre to Lake Louise town centre. Grab breakfast and lunch to-go from the Trailhead Cafe in the Lake Louise shopping centre. Drive to Moraine Lake to take photos. (Great to photograph at mid to late morning). Walk 10 minutes up the rock pile in order to get the famous view of Moraine Lake. Option 1: Hike the very challenging Mt Temple hike leaving from Moraine Lake (16km, 7-10 hours). Drive to Lake Louise. (Great to photograph at sunrise). Rent a canoe and paddle on Lake Louise. Option 2: Hike the more moderate hike to Lake Agnes Tea House (6.2km, 1.5-4 hours). If you want to make it more challenging and equally more rewarding, continue from the Lake Agnes trail to the Six Glaciers trail for two teahouses in one day (16.1km, 8 hours). Sunrise at Lake Louise before heading to Moraine Lake for mid to late morning light. Sunset at Herbert Lake (a 15 minute drive from Lake Louise along the Icefields Parkway). If going for the sunrise option, I would highly recommend doing the drive from Banff to Lake Louise after having dinner in Banff on Day 1 so that you spend the night in the Lake Louise area. Take advantage of breaks in the weather by continuing the plan. However, the only hike attempted should be to the Lake Agnes Teahouse where there will be shelter and a warm beverage at the end. 1. Trailhead Cafe- Great option to get breakfast as well as lunch to-go for your hike. 1. (High End) Baker Creek Mountain Resort (between Lake Louise and Banff)- If you're willing to splurge, this is the place. Enjoy your own luxury cabin for the night. 2. (Budget) HI Lake Louise (Hostel)- I really liked this hostel and even enjoyed the restaurant. Spend 1 night/2 days or 2 nights/3 days at one of the most desirable areas in the Rockies (must make reservations to camp 3 months in advance (to the day) OR reserve a bed at the Elizabeth Parker Alpine Club Hut or at the Lake O'Hara Lodge). If you are planning far enough in advance, I'd say that this is NOT an add-on and you must not pass this one up! Other options are to do Lake O'Hara as a day-hike, where you will need to reserve a bus will take you from the Lake O'Hara parking lot up the 11km gravel road (self-driving is not permitted due to Parks Canada limiting the number of visitors to the area). Drive to the Lake O'Hara parking lot. Catch the first shuttle bus up the 11km restricted-access road (8:30am) (reservation required for day hikers, reservation on the bus is included for everyone staying overnight). Hike the Lake O'Hara Alpine Circuit (13.3km, 6-7 hours). Hike Lake McArthur (7km, 2.5 hours) and Odaray Grandview (8.2km, 3 hours) as a single day hike. Option 2: Stay another night and do a challenging hike on day 3 before descending that day. Hike Yukness Mountain (8.4km, 5-6 hours). Note: If you decide to reserve the shuttle bus only (not an overnight trip), you should do the Alpine Circuit. The biggest mistake I made on my first trip to the Rockies was doing the Icefields Parkway in one day. There are SO many hikes and viewpoints that by giving yourself part of Day 4 to finish the parkway, you can pull over at ALL the pullouts to get the full experience! The total drive time from Lake Louise town centre to the last viewpoint for this day is under 40 minutes, so if you aren't planning to stay at one of the resorts or inns (which requires booking in advance), you can leave some flexibility here and choose one of the many campsites or HI wilderness hostels along the way which don't usually fill up. However, to see the sunrise the next day from Peyto Lake, the closest accommodation would be Num Ti Jah Lodge or HI Mosquito Creek. Stop at Herbert Lake for photos. (It's on the side of the road- don't miss it!) (Great to photograph at sunrise and sunset). Hike Helen Lake/Cirque Peak (12km, 4 hours (or 16km, 6 hours to Cirque Peak)) and enjoy lunch at Helen Lake. Photos at Peyto Lake view point. (Great to photograph at sunrise or mid-day to mid-afternoon). Optional: A couple other trailheads you will pass along the drive are for Bow Glacier Falls (9km, 3 hours) and Bow Peak (12km, 4-4.5 hours). Past the Peyto Lake viewpoint, trailheads include Parker Ridge (4km, 1-2 hours) and Mistaya Canyon (1km, 1 hour). Sunrise at Herbert Lake, a 15 minute drive from Lake Louise. However, if you wanted to another sunrise at either Lake Louise or Moraine Lake, this is the time! One option could be to postpone the Icefields Parkway until the next day (that is, if the forecast shows improvement). If you choose to postpone, your day 4 would be to do day 3's plan to Peyto Lake and then turn around and come back along the parkway to spend another night in Lake Louise, eliminating day 4's plan to see the Edith Cavell Glacier and Jasper (not as important). You could then spend your actual day 3 doing one of the rainy day alternatives from day 1 and continue day 5 as planned from Lake Louise. Food: No options after leaving Lake Louise. Be prepared to eat at the lodge or cook for yourself at the hostel. 3. (Budget) One of the HI Wilderness Hostels e.g. HI Mosquito Creek, HI Rampart Creek, etc. Explore more than most by taking adventures as they come, staying a 2nd night along the parkway before continuing on to Jasper as planned for the next day. From HI Mosquito Creek or the Num Ti Jah Lodge (any other hostels or inns would require some backtracking, which isn't so bad!) from the previous day, make your way along the parkway to the Glacier View Inn or the HI Hilda Creek Wilderness Hostel. Along the way, you will pass trailheads to hikes that are highly recommended. Since they are on the shorter side, choose a couple! Continue along the Icefields Parkway towards Jasper. Stop to hike Wilcox Pass (8km, 2-3 hours) to get a view of the Columbia Icefield. Take a worth-while detour to the Edith Cavell Glacier, where you walk to the base of a glacial lake. Option 1: Continue from the base of the glacial lake to the Cavell Meadows Summit (9.5km, 4 hours). 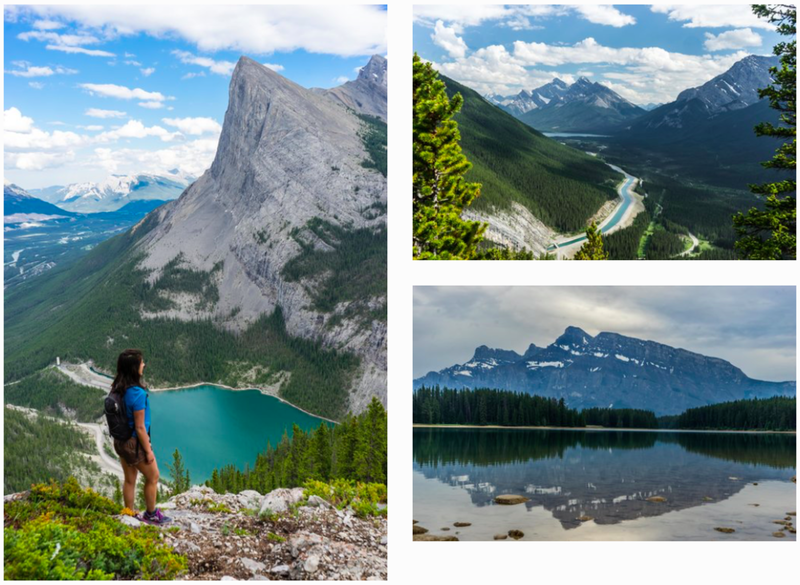 Option 2: Other highly rated hikes in the area include Campus Pass (31.9km, 10-12 hours), Verdant Pass (19km, 6-7 hours) (pictured in first photo), and Tangle Ridge via Tangle Pass (17.6km, 6-8 hours). After arriving in Jasper, drive the short distance to Pyramid Lake. There is an awesome bridge to an island that you must see. Option 3: Drive the scenic 1 hour route from Jasper town centre to Maligne Lake. There is a very popular 22.5km kayaking trip that can be done in one day to Spirit Island if you start early (or preferably overnight like in add-on 7) or a lake cruise. Sunrise from the Peyto Lake viewpoint, just a 15 minute drive if staying at HI Mosquito Creek or the Num Ti Jah Lodge! 1. Maligne Lake- The drive to Maligne Lake is extremely scenic so make a day of it, enjoy the restaurant and explore around the lake. Option to take a boat cruise to Spirit Island (although, add-on 7's kayak trip to Spirit Island is preferable)! 1. Coco's Cafe- Best for getting breakfast and lunch to-go. Vegan and vegetarian options. 2. Patricia Street Deli- Good for getting a sandwich to-go. 3. Famoso Neapolitan Pizzeria- Vegan options, but I enjoyed it more as a vegetarian. 4. Earls- A Canadian chain that is always good. 1. (Moderate to High end) Jasper hotels and cabins- I plan to try out a cabin option next time in Jasper. 2. (Budget) Jasper Downtown Hostel- Just remodelled and very nicely done. 3. (Budget) HI Jasper Hostel- A bit more in the wilderness and more beds per room, which I found less enjoyable. 1 night/2 days on Jasper's most popular backpacking trip (campsites require reservations in January, the cabins are often available to be reserved later). Option 1: Out and back trip seeing the "Heart of the Skyline" (28.4km out and back to lodge/campsite plus 14.2km day hike over the Notch to the NW slope of Amber Mountain). Drive to the Wabasso Lake trailhead. Hike 14.2 km (3.5 hours) to the Lodge or campsite. Drop your bag and day hike. If nice weather and clear, hike over the Notch to the NW slope of Amber Mountain. If not, be hopeful to do it the following day and can do a 11.2 km optional hike over Big Shovel Pass to the middle of Snowbowl instead. Hike over the Notch to the NW slope of Amber Mountain if you haven't already before returning down the same 14.2km to your car. Option 2: The traditional Skyline Trail (44.1km one way), starting at Maligne Lake trailhead and ending at Signal Mountain trailhead. This requires booking a shuttle to return you to your car or hitchhiking. One night at Snowball Campground, Curator Campground, or the Shovel Pass Lodge should be booked. 1. Curator campsite- challenging to get a reservation, as it is usually booked up by January. 2. Shovel Pass Lodge- eliminates need for campsite reservations and a backcountry camping permit. 3. Watchtower campsite- located 3.4km off the Skyline and is less challenging to get a reservation. Take 2-4 days on out-and-back trip to Berg Lake to experience Mt Robson's iconic peak (campsite reservations need to be made early in the year). Drive to the Mt Robson Trailhead (2km from the Mt Robson Visitor Centre). Hike 21 km (6-7 hours) to Berg Lake. It is 42km roundtrip. Option 2: Day hike on day 2 from Berg Lake to Snowbird Pass (21.2km) or from Berg Lake to Hargreaves-Mumm (12km) (easier but just as grand) before exiting on day 3 (3 days/2 nights). Option 3: Do both day hikes, one on day 2 and one on day 3 before exiting on day 4 (4 days/3 nights). Lodging at Berg Lake backcountry campsite each night. Reservations required. THE VERY POPULAR 22.5KM KAYAK/CANOE TRIP CAN BE DONE IN ONE DAY, BUT IT IS A BIT AMBITIOUS. IDEALLY, WITH THIS OVERNIGHT OPTION, YOU SPEND TWO NIGHTS AND GO EVEN FURTHER THAN SPIRIT ISLAND (BUT EVEN ONE NIGHT GETS YOU TO THE MOST STUNNING PLACE). BOOK EARLY TO RESERVE THESE CAMPSITES OR TO GET THE AMAZING VIEWS WITHOUT RESERVING SITES/CAMPING, TAKE THE MALIGNE LAKE BOAT CRUISE TO SPIRIT ISLAND. For one day adventures, there is a boathouse located at one of the docks at Maligne Lake. Otherwise, renting with Pure Outdoors will allow you to go out for multiple days (a 25% discount is given for any additional days). Plus, they drop off and pick up free of charge and they provide all the necessary gear (life vests, paddles, water pumps, kayak skirts, floatation devices, etc). Drive the scenic 1 hour route from Jasper to Maligne Lake. Going early (dawn) to get a headstart on the day means you might see wildlife on the drive there! Kayak/canoe from the Maligne Lake Boat Ramp to Fisherman's Bay Campground (~13km). This can take approximately 2 to 4 hours or longer if the wind conditions make it more challenging. From the campground, Spirit Island is a 15 minute paddle away and a great place to see the sunset (and sunrise!). Kayak/canoe to the second campsite on the lake, Coronet Creek campground, (8km, ~2-4 hours) (ideally after seeing the sunrise at Spirit Island again). There is an additional trip from Coronet Creek called the Henry Macleod Trail (16km, 5 hours return) that can be done on arrival or if you opt to spend an additional night at the Coronet Creek campground. Lodging at the two campsites along the lake, Fisherman's Bay and Coronet Creek, need to be reserved EARLY in the year to get a spot. However, cancellations are so common that a lot of people risk it and find that half the campsites are empty! The last day is also flexible. Head back along the Icefields Parkway to Calgary for your flight. However, give yourself the time to take a detour to Emerald Lake in Yoho National Park, BC. This is a busy spot so it is ideal to go early morning (up until 9am) and anytime after 7pm. If you set your flight for Day 6, lodging options are listed for Day 5 as well as additional activities! Drive back along the Icefields Parkway from Jasper to Emerald Lake (Yoho National Park). Paddle on Emerald Lake ($60 per hour). Check their hours. Walk around the beautiful Emerald Lake Lodge. Notice signs for 'Natural Bridge' while driving back down along Emerald Lake Road. It is a worthwhile stop for photos. Optional: Drive and walk a short distance along a paved road to Takakkaw Falls or for something more intense, do the Iceline Trail (12.8km, 4-7 hours). None, this plan is still doable. 1. The Siding Cafe- One of my favorite lunch spots with vegan and vegetarian options! 2. Truffle Pigs Bistro & Lodge- Lunch or dinner with vegan and vegetarian options. 3. Emerald Lake Lodge- They have three restaurants. Limited vegan and vegetarian options. Lodging: If you can swing catching an early flight the next day, stay the night in either Field, BC, the Lake Louise area, or Canmore. 1. (High End) Emerald Lake Lodge (Field, BC)- If you are willing to splurge, this is the one. It is secluded, private, and adorable. 3. (Budget) HI Lake Louise (Hostel) in Lake Louise- I really liked this hostel and even enjoyed the restaurant.